Last week was a surprisingly great week for new comics. Books like Terraformars, Through the Woods, and Seconds all were published to great fanfare. 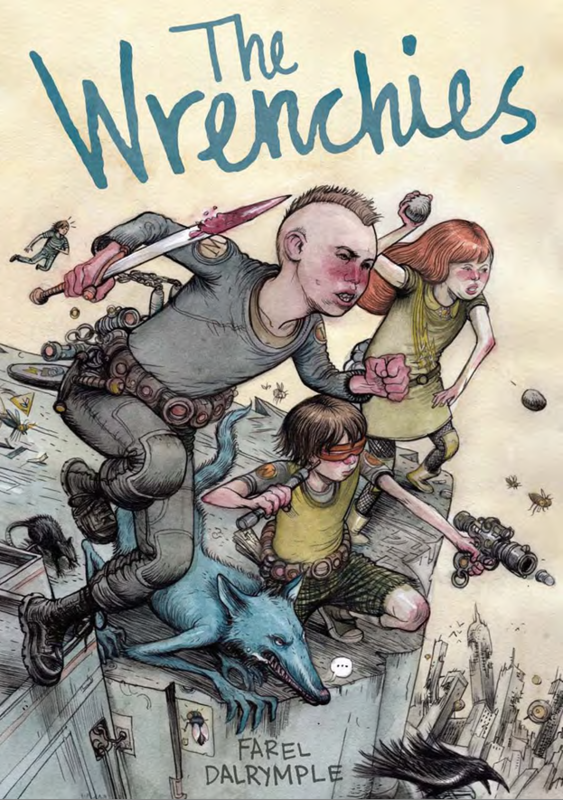 But the book that came out last week that I read first was Farel Dalrymple’s The Wrenchies. I was expecting it to be out around September, so getting it early was a great surprise. An even greater surprise is how stylistically and intrinsically odd The Wrenchies is. If ever there was a time to call a comic book a fever dream, now is that time, and The Wrenchies is that comic. In many parts, a gang of super-powered children, adults from an alternate dimension, and a boy from the past in a superhero suit all team up to destroy an ancient evil called the Shadowsmen who have taken over the world. 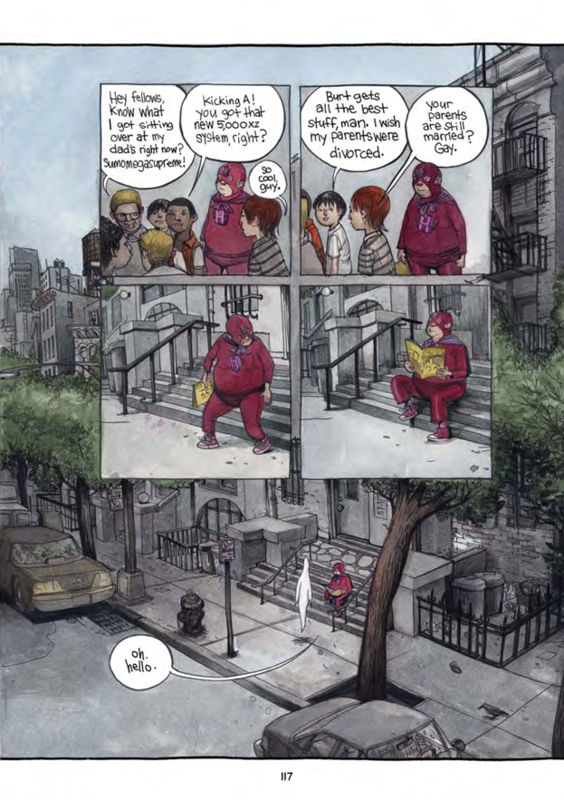 Dalrymple’s art is one of the key features of any of his comics, but in The Wrenchies he stretches and pulls his abilities in ways that are astonishing and exhilarating. 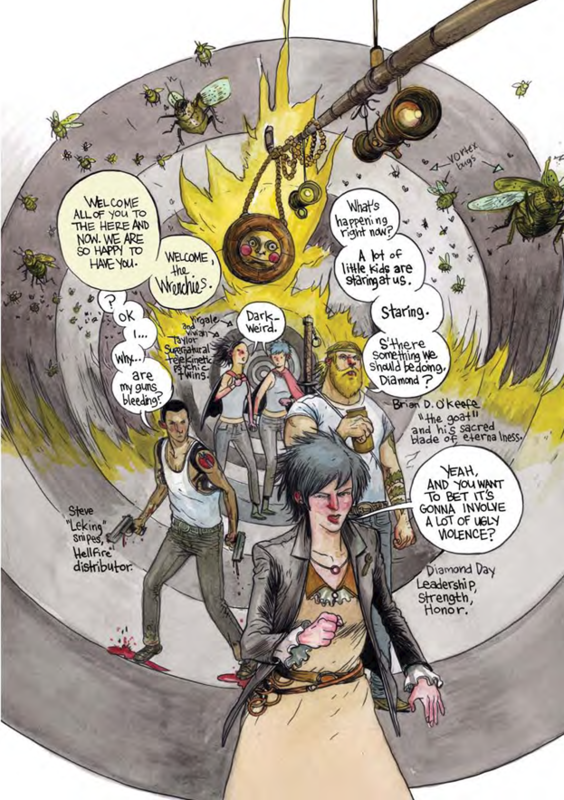 With a mix of dark inks and oversaturated water colors, Dalrymple quickly sets the tone for the book – noxious, dangerous, mystifying. Dalrymple uses color in really cool ways – a concert scene in the first 70ish pages comes to mind with its mix of reds and pinks, simulating darkness and fire. It is clear above all else that Dalrymple has slaved over the illustrations of this comic, and the result is a true joy to behold. The story leads the Wrenchies on an epic quest to find the poisoned and manipulated body of Sherwood, the progenitor of the chaos and the source of the Earth’s damage. Taken at face value, the book meanders through multiple storylines, with flashbacks and retellings. But nothing about The Wrenchies should be taken at face value. Consider Sherwood – the story shows that he is the source of the damage and evil feeding the Shadowsmen. But is this evil world a manifestation of Sherwood’s mental illness? There are many potential theories about the source and reality of The Wrenchies‘ dark, polluted world. Is this Sherwood’s breakdown after accidentally killing his best friend in a drug-induced stupor, or perhaps Sherwood’s failed attempts to cope with the unexplained loss of his brother Orson? Conversely, the source of the fantastic story may not be some deeper darkness, but the overactive imagination of Hollis, a boy trying to navigate between his love of fantasy, his mother’s deeply religious ties, and the schoolyard bullies. And what does the end of the book tell us about the “truth” of The Wrenchies, if such a thing can even be derived? With The Wrenchies, Dalrymple wrings out the darkness of the human condition and builds it up so that he can tear it down with his cast of wizards, ninjas, and marksmen. And despite all my questions, it’s clear that Dalrymple has created something fantastic in The Wrenchies. Recommended. Farel Dalrymple’s The Wrenchies is published by First Second (tumblr: firstsecondbooks). You can find Farel on twitter here, and read his series It Will All Hurt, which is set in the same universe, at study-group.